Without the benefit of Harrison Ford, this country has its own “public art.” I always figured that this wolrd leader in puffin-kissing and tree-hugging would be clear all around. I hadn’t realized that they have scumbags defacing public and private property. It’s so bad that the cover story on the English-language Reykjavik Grapevine shows a building covered in graffiti and talks about vacancies. I haven’t read the article yet, but I think I have the gist, especially given the imminent real estate price drop in this city. While I sound ready to condemn Icelandic graffiti, I am restrained by a sad fact: though not visually appealing, it is the best artwork in Reykjavik. I asked my walking tour guide about the Icelandic art scene. He replied, “Eh.” A trip to the local galleries made his statement seem optimistic. Reykjavik’s galleries had more snowy landscapes and ocean paintings than those in Quebec. It was awful. The Einar Jonsson Museum Sculpture Garden wasn’t bad. 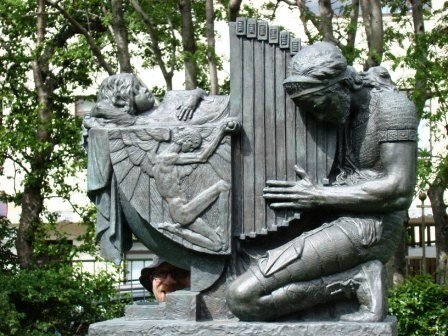 Jonsson, I guess, is Iceland’s most famous sculptor. He’s dead now. The stuff I saw … not bad. I’d take the work of New Yorker Julio Aguilera over Jonsson any day, though. 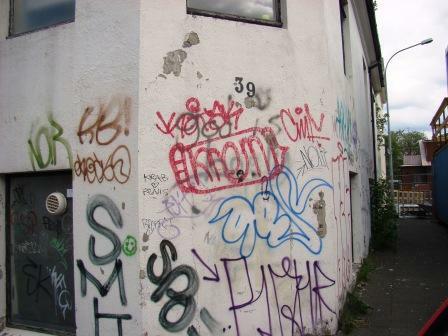 This entry was posted in Travel and tagged Art, Graffiti, Harrison Ford, Iceland, Julio Aguilera, Reykjavik on June 5, 2008 by Tom.